Tuesday 2nd April - When I went out with Guillaume last Tuesday, I ended up wearing Johnny Depp's hat (read about it here). 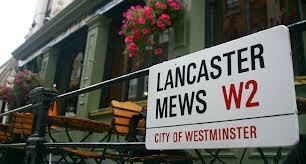 A hard act to follow - can Lancaster Gate, Edgware Road and Notting Hill come up with anything better? We started off near Bond Street at Patty and Bun. These guys have built up an excellent reputation for their fast-food, messy burgers. Even at 4pm on a Tuesday afternoon, the little diner was packed and we were lucky to get on to a table straight away. 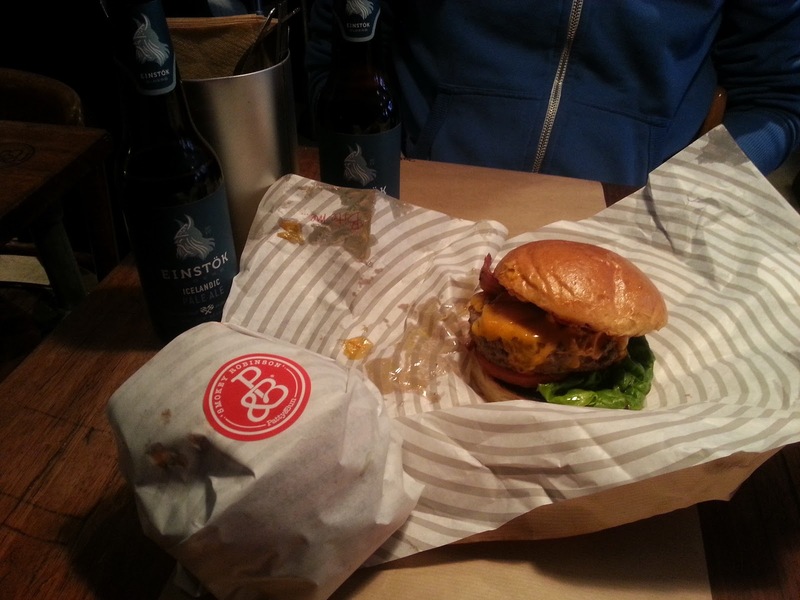 I went for the Smokey Robinson burger this time around, but might go back for the Lambshank Redemption! We washed them down with a nice bottle of Einstock Pale Ale from Iceland. We were in and out very quickly, and I will definitely return or perhaps just get takeaway which they also provide. Good luck to them in the upcoming London Burger Bash! We decided to walk through some backstreets (passing two slightly terrifying looking policemen carrying machine guns) to get to Old Mary's underneath The Mitre pub in Lancaster Gate. Sadly I hadn't done my research and Old Mary's is only open from Wednesday to Saturday from 5pm. We made up for it by having a cheeky pint outside (in the sun!) courtesy of The Mitre on their pleasant cobbled street before moving on. Our next stop was BBQ Whiskey Beer (follow them here) at The Wargrave Arms near Edgware Road, so we decided to be good Londoners and walk the long way round via Little Venice. 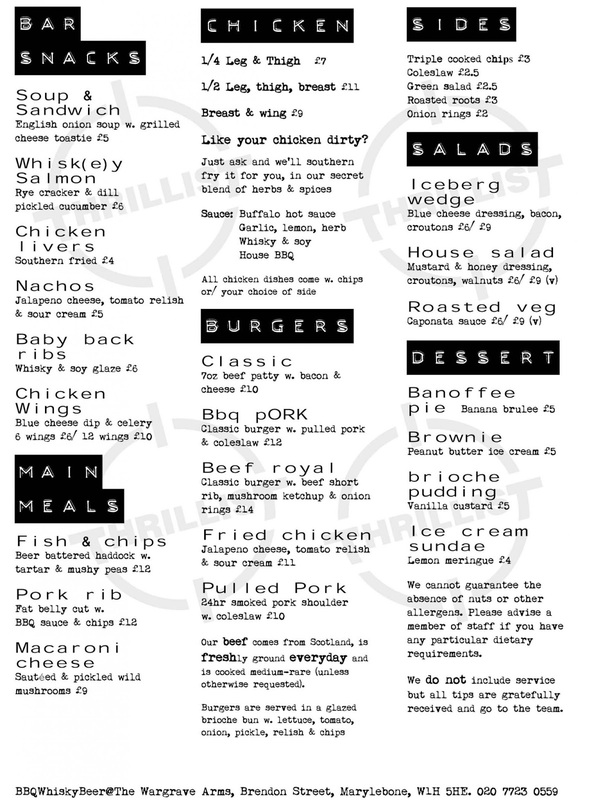 These guys have taken over the whole pub, serving up awesome BBQ food and offering an impressive choice of whiskeys. The "Beer" section sadly doesn't quite match the other two, with standard Young's choices plus Tribute and Purity Pale on tap - hardly sets the heart racing. Anyway. the food was outstanding! We both went for Southern fried buttermilk chicken with chips and coleslaw. Will made the right choice in going for the Whisky and Soy sauce on the side, though their house BBQ sauce is also delicious. Our whiskeys were both interesting and good value too. 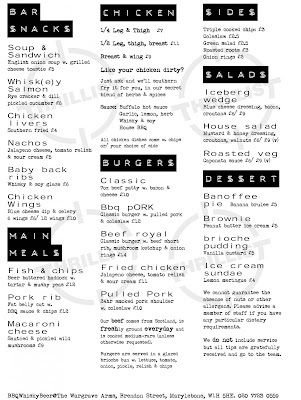 I recommend heading down there on a Monday night for their boilermaker deals - Beer, BBQ food and Whiskey for £15ish. Their whiskey flights are another good option - Do Not Talk About Flight Club. They also do whiskey tasting events and the next one is on Monday 8th April - booking info is here. With the night still young, we hopped on a tube over to Westbourne Park (north of Notting Hill) to visit a couple of places before heading home. Our first stop here was The Rum Kitchen - "A Caribbean Inspired Beach Shack Restaurant and Cocktail Bar" on All Saints Road. 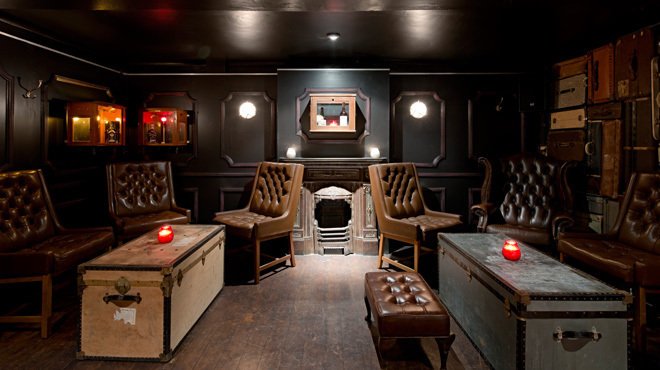 The atmosphere was great for a Tuesday night - this is the kind of place I could spend all night in. 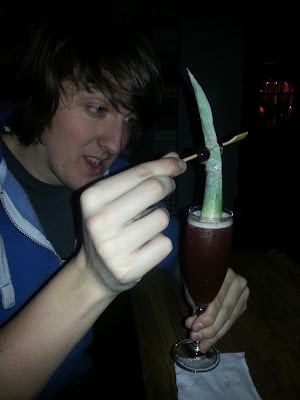 Our rum cocktails were very drinkable - check out the monster coming out of Will's manly Whistlebelly. For something a bit different, go for Mama's Guinness Punch. The food looks good but we didn't have any space left after Patty & Bun and BBQ Whiskey Beer. What's more, they have a dedicated rum cellar bar downstairs - check their website as it currently isn't open every day - enough reasons to go back! 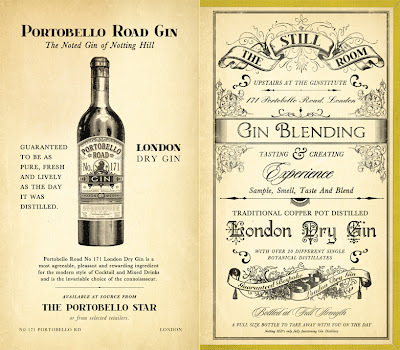 Next we tried out Portobello Star that occupies a site that "has been serving alcoholic beverages to London residents and visitors since 1740". The drinks pamphlet is a collector's item, filled with interesting recipes and poems - they win the best cocktail pun of the day with their drink 'Large Hadron Colada'. We both went for the potent but well-balanced Admiral Vernon's Grog after our Rum Kitchen barman, Steve, recommended it. The interior design sadly doesn't match the effort that has gone into the drinks and the website, and the atmosphere wasn't great though it was a Tuesday night. 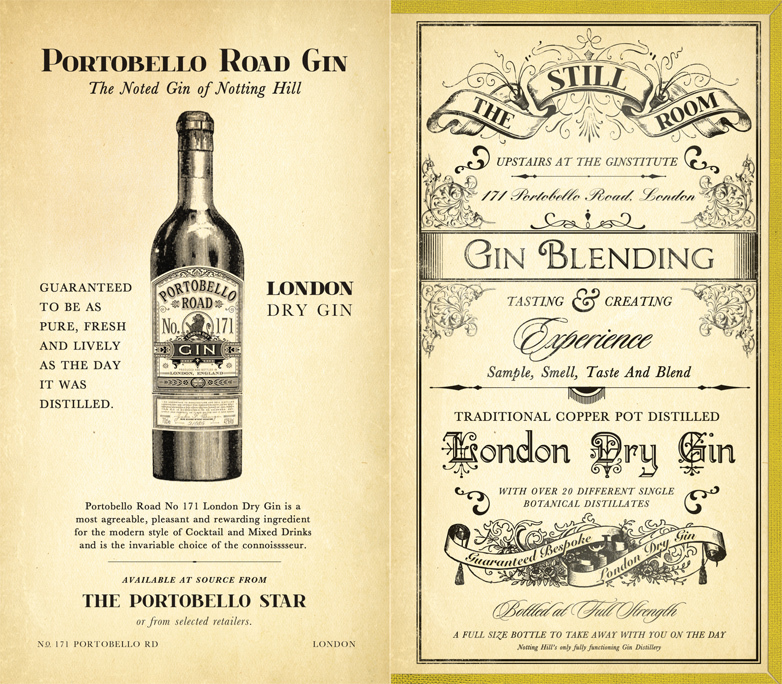 For serious gin fans, book a ticket for their Ginstitute experience held upstairs in The Still Room. Our last stop was Montgomery Place round the corner. Several barmen have recommended this place for the high quality mixology that is going on. The décor is very inviting, with musical instruments scattered around in various forms (lampshades, bookends etc). 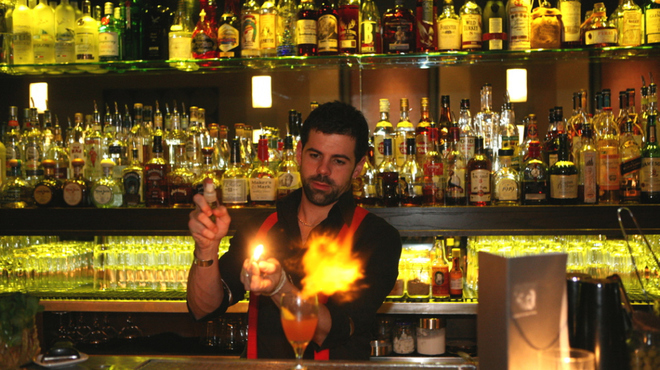 The bar staff clearly know what they are doing, and have an amazing array of spirits to choose from. It is on the pricey side but worth a visit for a special night out - you will be treated well. They serve food as well so there is no need to leave! It wasn't as crazy as last week's adventures around Goodge Street, but we discovered 5 new places that are worth looking at, even if they aren't that quirky. We also walked between most of them which is much nicer than taking the tube. I am in the process of putting together a google map of List places, potentially with suggested routes attached so that you can walk through some secluded back streets too. I'm sure these things exist already, but I like having a visual record of where I have been! Thanks to Will (who has picked up another 5 points) and to you guys for reading to the end. If you have any suggestions of places that should make The List (bear in mind, it is several pages long already!) then please leave a comment or send a tweet to @matthew1hickman.